If there is only one “Top priority” setting for your tasks, you will soon find your dashboard / todo lists can turn into one big list of “very urgent” tasks that have not been completed. In Dooster, the new, easy, online task manager tool, when you create a task or event you will see two priority levels on offer: Importance and Urgency. Allowing 2 settings, important vs urgent, makes things a lot clearer and easier to get done. Please note: You do not have to set a priority for either the urgent or important values. You can use one, both or none. Below shows how the various settings will appear on your dashboard. Dr Stephen Covey is a world renowned teacher on organization and time management. For Covey the important vs urgent theory goes deeper than just getting stuff done. Covey stresses that we’ve become “addicted to urgency” at the expense of what is truly important. Covey’s framework aims to prioritize work that is aimed at long-term goals, versus tasks that appear to be urgent, but are in fact less important. His Urgent vs Important 2 x 2 matrix shown above classifies tasks as urgent and non-urgent on one axis, and important or non-important on the other axis. 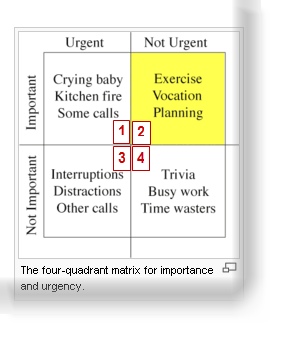 Quadrant 2 (see yellow cell – above) shows the tasks that are non-urgent but important. These are the ones Covey believes we are likely to neglect; but, should focus on to achieve true effectiveness. While designing Dooster we did not subscribe to any one Time Management “ideology” eg David Allen’s Get Things Done. Many of them have some great ideas but their insistence on sticking to one ideology can be restrictive. However we did decide to follow the non-urgent vs important approach to setting priorities. This became known as the “Eisenhower Principle”. Alec Mackenzie and Pat Nickerson’s The Time Trap (1972) was the first prominent Time Management book to note this difference between importance and urgency. This was refined and further championed by Covey in his famous book The Seven Habits of Highly Effective People (1984) and First Things First (1994) by Stephen Covey, A. Roger and Rebecca R. Merrill – from which the above matrix is taken. It’s free to try and takes seconds to start using. Dooster has excellent testimonials and can greatly improve your productivity – whatever you’re trying to get done.